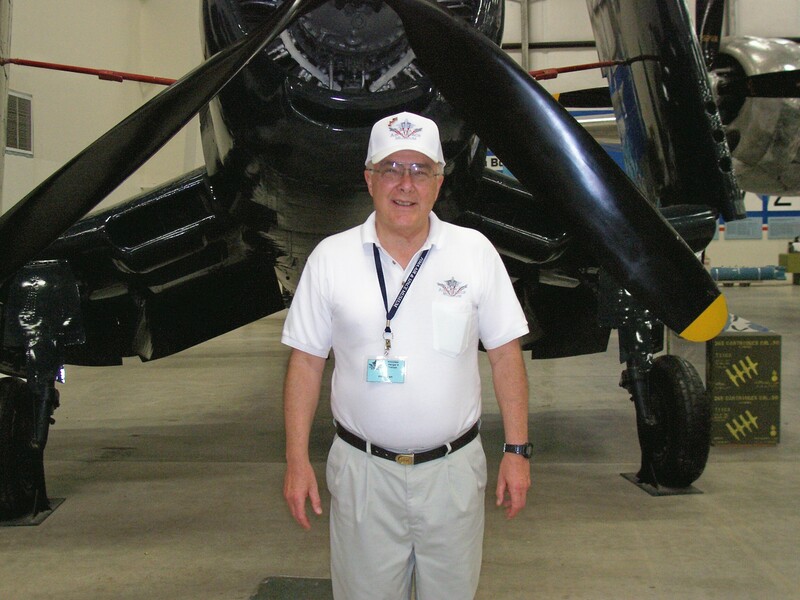 Ed Heinemann, chief engineer of Douglas Aircraft decided on a design that would minimize the size, weight, and complexity of the aircraft. 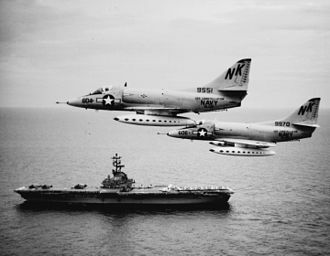 The result was an aircraft about half the weight of the aircraft had the USN had proposed and less the $ 1 million cost per copy of the proposal. Its wing was so compact that it didn’t need a wing tip folding for storage on aircraft carriers. On account of its size such nicknames as “Scooter”, “Kiddicar”, “Bantam Bomber”, “Tinker Toy Bomber” and because of its speed, “Heinemann’s Hot Rod”. It set a world speed record of 695 mph on 15 October 1955. The aircraft was typical of post -World War II design with a lower mounted delta wing, tricycle landing gear and a single turbojet engine in the rear of the fuselage with two intakes on the side of the aircraft. The horizontal stabilizer is mounted above the fuselage at the rear of the aircraft. It had two 20mm Colt Mk-12 cannons one on each wing. As mentioned earlier, it had 5 hardpoints for missiles and bombs. The jet engine could be accessed for engine change by removing the aft section of the fuselage and then removing the engine. 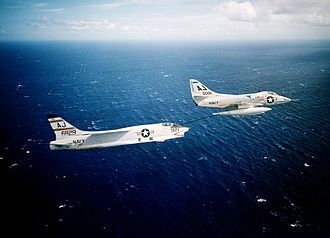 In the A-4 Skyhawk designed the concept of operation, the “buddy” refueling system “. In this concept, one A-4 was designed as the “tanker” which meant no ordinance was loaded on the aircraft while on the ship. Only a large center fuel tank was placed on the Skyhawk. The “tanker” A-4 would take off first and the other A-4s could be loaded with a minimal fuel load and with ordnance right up to maximum takeoff weight (MTOW) and then refueled with the “tanker”. The -4s would then be on their way to its target with a full load of fuel and ordnance. This concept is used by the F/A-18 Super Hornet today. 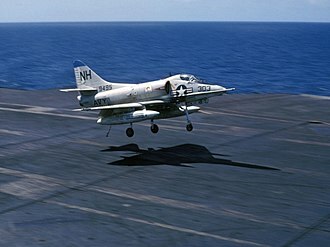 The USN Operated the A-4 Skyhawk as a training and adversary aircraft well into the 1990s while removing them from front line attack squadrons as early as 1967. 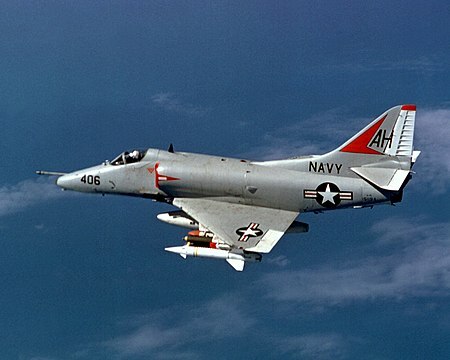 The USMC refused the A-7 Corsair as a replacement for the A-4, but kept the Skyhawk and in fact ordering the new A-4M model. These A-4s were finally retired in 1994. The A-4 Skyhawk was USN primary light attack aircraft during the Vietnam War. The A-4 made the first air strikes of the war and a USMC A-4 was said to drop the last bomb of the conflict. During the War, USN notables Lt. Commander Everett Alvarez, Lt. Commander John McCain, and Commander John Stockdale. The only victory over an enemy Mig that was by Lt. Commander Theodore Swartz from the USS Bon Homme Richard. 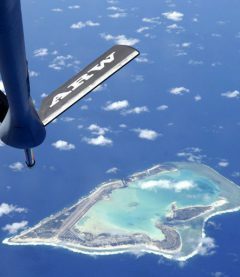 It was in the mid-80s, I was on Wake Island as a DOD contract worker. Our company ran the whole island from Power Plant to the Flight Line. I worked in Base Operations during that time. The USMC was operating a Transpac (ferrying a squadron of fighters in, this case, A-4 Skyhawks across the Pacific) to a base in the Mainland USA. The Transpac consisted of 12-19 Skyhawks (exact number unknown) and two USAF KC-10 Aerial Refueling Tankers. They left Iwakuni, Japan, and the tankers out of Yokota AB Japan. They joined together over Tokyo Bay for the first refueling. 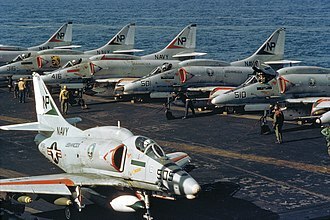 Several A-4s were “topped off” and the tanker was starting to fuel another A-4, when turbulence caused the probe on the Skyhawk to hit the drogue basket (trailing the KC-10, used for refueling) which broke the fuel line to the drogue basket which caused the A-4 to ingest raw JP-5 fuel which stated an engine fire on the Skyhawk. The pilot ejected from the A-4 and parachuted into Tokyo Bay. He was rescued by a Japanese fish boat. Meanwhile, I was working Base Operations that morning and I got an alert on our AFTN (Aviation Teletype Network) circuit that the first cell of 6 A-4s and 1 KC-10 were returning to base (RTB) then I got another alert that the second cell was also RTB. This was highly unusual. Occasionally a single fighter and wingman might divert either back to base or another airport if they are experiencing a maintenance problem depending on where they are along the path to their destination. But for all of the Transpac to return to their bases was highly unusual. Of course, I didn’t know anything about the fire and ejection of the pilot from the A-4. When I found out what had happened I figured the pilot would be in the hospital for a while. But the next day the entire Transpac left Japan and landed on Wake without further incident. I asked the Transpac Coordinator (usually LCOL USMC Officer) how the pilot who had to bail out was doing. He said “he is in the back of that truck by the Wake Terminal, ask him” It shows on tough and rugged a USMC Pilot can be. True Story. Skyhawks were well loved by their crews for being tough and agile. Plus the low costs and operating costs, as well as easy maintenance, made the A-4 popular at all levels of the military. There are about 43 A-4 Skyhawks that are airworthy at various airports and museums throughout the United States. 137813 National Naval Aviation Museum NAS Pensacola, Florida. This is Just a Partial List of the A-4 Skyhawk on Display. Check With Your Local Air Museum for More Information.